Peter and his father are moving to a new house in the woods, along with Harold, who is a good dog. Peter is not happy, and he and Harold stare out the bedroom window at the woods on the other side of the bridge, wondering what is in them—and what might come out of them. In the daytime, Peter and Harold take a big pile of pillows and blankets and fashion a huge watchman, whom they name Lenny, to make sure that nothing comes over the bridge during the night. Since Lenny looks so lonely, the next day Peter creates Lucy to be his friend. The Steads’ very first collaboration, the poignant A Sick Day for Amos McGee, won the Caldecott Medal, and this third creation also has the hallmarks of excellence. This is not a storytime picture book, but rather a book for little ones to cuddle up in your lap and pore over the detailed drawings that require attention in order to catch the surprises. As an adult, I must admit that I found Lenny and Lucy a little disconcerting, and the first page I turned in which Lenny was actually holding a glass of milk gave me a bit of a jolt. 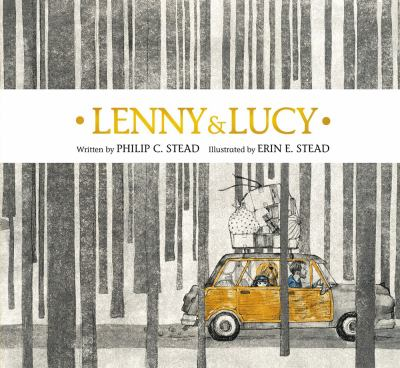 Hopefully, children will see Erin Stead’s characters as funny and friendly, but they are somewhat uncomfortable. My years presenting puppet shows taught me that young children often enjoy that edgy line between reality and illusion. There is a sweet little owl who can be found on many of the pages, and children will have fun searching for him. Philip Stead’s text is quite understated; each word carries worlds of meaning. He crafts his stories around Peter’s feelings and the plans he makes to deal with them. Peter is unhappy and afraid, but except for his fear of the woods, we don’t know anything about him. Did his parents divorce? Did his mother die? Does his father have a job, and why in the world did he move his child out to the wilderness, anyway? And who is this bold woman bringing him casseroles at night? Oh, wait. That’s an adult reader talking. The tone of the book is straightforward, but sweet; a bit sorrowful and anxious in the beginning, but growing hopeful by the end. Peter’s determined efforts to confront his fears and solve his own problems can speak to fearful children everywhere. Somehow, this pile of pillows and blankets leads to a cozy group of friends and the belief that these scary woods might just be a good place for a new home, after all. I have been struck recently by how many people have told me that they never read history or historical fiction. This is totally understandable if they had the same sort of high school experience that I had, being taught history by a coach who can’t pronounce the names and who thinks that memorizing battle dates is the most important part of the job. However, I grew up to be a homeschooling mom with access to brilliant materials that taught me that history is the story of people’s lives and thoughts down through the ages, and who doesn’t love a story? The kids in our fantastic Mock Newbery Club were raving about a recent historical fiction novel that I had skipped because I didn’t like the cover. (Yes, I judged.) 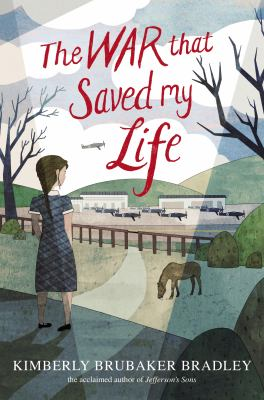 The War that Saved My Life, by Kimberly Brubaker Bradley, is a World War II novel with a difference. Like the Pevensie children of Narnia fame, these kids were sent away from their London home to the English countryside in order to spare them from the Nazi bombs. For most families of that time, this was a heart-rending decision, and most parents and children longed to be reunited at the end of the war. For Ada and Jamie, though, it was the best thing that ever happened to them. Ada was born with a club foot, and her heartless single mom never let her leave their apartment. She taught Ada to be ashamed that she had ever been born and would often lock her into a cabinet under the sink that was crawling with roaches. When Ada heard that children were being sent away, she saw a chance for escape and ran with Jamie onto the waiting train. Susan was a single woman, also, living in the country, and she had no desire for children in her life. However, the stern village leader forced her to do her part for the war effort, and so this unlikely trio started a life that changed all of them in ways they never expected or wanted. The people in this story are all thorns in the beginning, but the character development they experience is astounding, and yet believable. Ms. Bradley has cast a spotlight on a neglected scene in history: that of an entire generation of British children growing up among strangers, and of an entire generation of British adults caring for children who were not their own. The war in Europe began in 1939 and lasted until 1945, longer than the United States was involved, so that is a significant portion of any child’s memory. There are so many discussable issues in this novel! Brilliantly and beautifully written, this story will remain with you for a long time. The Newbery Club kids were right! I followed this novel with a nonfiction offering about another small, almost hidden drama during World War II. 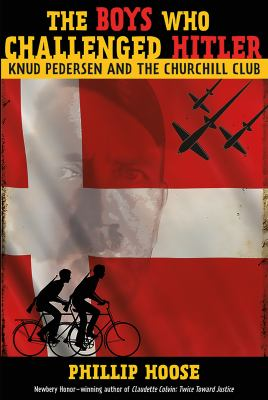 The Boys Who Challenged Hitler: Knud Pedersen and the Churchill Club is a slender volume about the Danish resistance movement that was started by a group of young teenage boys. Knud and his brother, Jens, were ashamed that their country had capitulated to the Germans without a struggle, when they had the inspiring example of the Norwegians next door who were raging against the Hitler’s occupation of their country. Since their father was a pastor, they lived in an enormous, old monastery with plenty of empty lofts that had fallen into disuse over the centuries. The Pedersen boys convinced a group of schoolmates to begin vandalizing the German trucks and equipment, thereby interfering with their ability to launch attacks against the Allied troops. As their efforts were successful, they tried more and more dangerous missions, stealing weapons and ammunition and stashing them in the monastery lofts, putting their own lives and those of their families at risk. This true story recounts how children shamed the adults of Denmark into mounting a broader, more organized resistance to the Nazis that only ended when victory was declared in Europe. Phillip Hoose is the author, but there are many sections that are told directly by Knud Pedersen himself, as Hoose was able to meet with him and then carry on an extensive correspondence throughout the writing of the book. Mr. Pedersen died just shortly after its completion late last year. Although the boys’ example is thrilling and inspiring, the author does not gloss over the price they paid for their patriotic heroism. In an age when so many people receive their news from Facebook and late-night television comedians, reading in-depth, thoughtful accounts of historical events is more essential than ever. It is not enough to learn that an event happened; we need to understand why world events take place. Why do cultures think and act as they do? What happened to them years ago that is shaping their opinions today? In the case of World War II, the people who can talk about it firsthand are disappearing. When I was young, I knew people who had fought in the war and others who had numbers tattooed on the inside of their forearms, a reminder of the concentration camps that would never disappear. Now there are whole nations that deny the existence of the Holocaust, and many young people act as if it is a relative truth. There may or may not have been a Holocaust, and does it really matter who is right? Yes, it matters very much! Truth is not relative, and Knud’s and Ada’s families were leading their everyday lives right up until the day that one powerful man from very far away decided that he wanted to run their country. American children need to learn—in age-appropriate ways—that our consumer-driven, self-satisfied lifestyle can disappear in a moment unless we are vigilant and have a government that is serious about keeping us safe. Read history—to yourself and to your children—that consists of more than 140 characters. We will all be grateful to you. Disclaimer: I read library copies of both books in this article. Opinions expressed are solely my own and do not reflect those of my employer or anyone else. History calls Alexander of Macedon “the Great” because he built one of the world’s largest empires centuries before the Romans even started out. In Eleanor Herman’s epic tale, however, Prince Alex is sixteen, untried, and ashamed of the disfiguring scar running down one leg. A student of Aristotle, Alex is appointed regent when his father, Philip, goes off to war, and he knows this test of his power could be the turning point of his life. The annual Blood Tournament brings representatives from all over Philip’s lands to the capital to test their prowess in combat. Alex and his friend Hephaestion have been practicing, and soon they will pit their skill against villagers like Jacob, whose beloved Katerina has secretly followed him. Kat has strange powers over animals, including the deadly hellion. Alex feels himself drawn to her, but he does not suspect that Kat’s reason for coming to the capital is to exact revenge for her mother’s death by killing the queen, Alex’s sorceress mother. In the meantime, the Princess Zofia, Alex’s betrothed, is in love with someone else, and so has run away in order to escape the marriage, only to be captured by slave traders. In a time when people married, had children, and conducted adult careers while still in their teens, these teenagers in high places are discovering that the choices they make affect many people, and that those they love the most are entangled in dangerous webs. 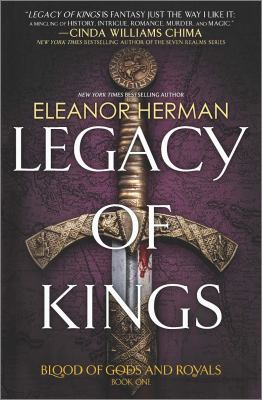 Legacy of Kings is the first in the series “Blood of Gods and Royals,” and is historical fiction with a smidge of fantasy. Told from six different perspectives, three male and three female, this wide-ranging epic has been called “The Game of Thrones” for older teens. Well, not quite, although characters do get killed off somewhat brutally, and individuals and cults can be thoroughly evil. Some of the major characters are developed more fully than others, and readers can hope that we get more of them in future installments. Still, this first volume is packed full of enough action, love, betrayal, power, plotting, deception, and passion to keep readers turning the pages long into the night. Introduce yourself and your teens to a smashing tale that makes medieval epics look futuristic. Recommended. Disclaimer: I read a library copy of this book. Opinions are solely my own, and do not reflect those of my employer or anyone else. Sometimes, all you need to know is in a children’s book. I have often been interested in a famous person of the past, only to find a shelf full of 800-page tomes about him at the library. I don’t need to know about his grandparents, I don’t want to read all of his letters or diary entries, and I don’t care how often he changed his socks. I just want to know why this person is famous, and why I should care. Children’s nonfiction is excellent for this— plus, it usually has better pictures. 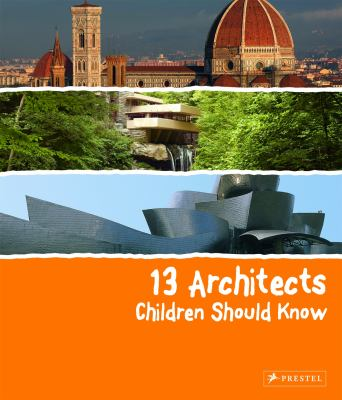 13 Architects Children Should Know is a great example. On two- or four-page spreads for each architect, it takes the reader from Brunelleschi to Zaha Hadid, showing clear photos of their work and explaining how each one heralded a change in the world’s understanding of architecture. There are also small pictures of the details of their buildings that seem so ordinary now, but at the time were amazing and brilliant. Love Palladian windows? You can thank Andrea Palladio, from the sixteenth century. Thomas Jefferson, who seems to have done everything well, rebuilt and remodeled his beloved Monticello all of his life. I learned about Antoni Gaudi in a teen novel about Barcelona. I think his buildings look like a dream, but some people think they look like nightmares. Frank Lloyd Wright somehow built Fallingwater so that it won’t actually fall into the water, which it constantly threatens to do. Architect Frank Gehry made a guest appearance on The Simpsons to talk about his buildings, including the Walt Disney Concert Hall, which looks as if it is taking off for outer space. So many treasures in the world! Happily for you, this book is part of a series by Prestel Publishing, including 13 Artists Children Should Know, 13 Buildings, 13 Sculptures, and so on. Click on the link to see them all. Very enlightening for adults looking for a quick art history brush-up, as well! Disclaimer: I read a library copy of this book. Opinions expressed are solely my own, and do not reflect those of my employer or anyone else.